An End of Year Reflection: Where did the last 3 months go? Wow. It's been a whirlwind of a year. Today is (somewhat incredibly) the last teacher day and it's been 3 months since this blog was updated. If you haven't heard about BreakoutEDU, it's time to jump on the bandwagon. This community is on fire! BreakoutEDU is an Escape Room for the classroom. The East Noble tech team had the opportunity to participate in a BreakoutEDU at the MACUL conference in March. Very soon thereafter, we ordered 14 kits for our district. The teachers at North Side Elementary were first introduced to BreakoutEDU at a professional development day. They loved it! 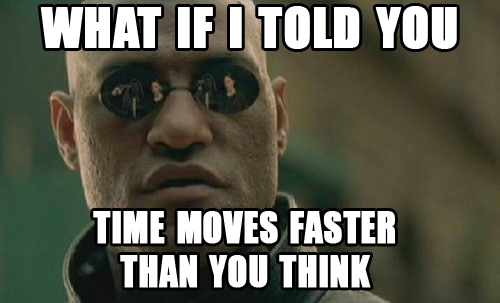 I had teachers ask if they could do a game with their students the very next day. Over the last month and a half, I've helped teachers run numerous games and have created a few games from scratch. The feedback has been unanimously positive from teachers and students alike. Not only are these games set up to provide students an opportunity to review classroom standards, but also gives students a unique way to collaborate and learn to work as a team. For many groups, the biggest challenge was learning how to communicate and to listen to all group members. 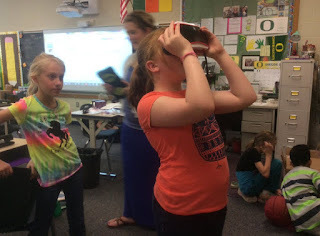 A few weeks ago, the Technology Director gave each of the Technology Integration Specialists a Google Cardboard Viewmaster and told us to test them out and get a feel for how we'd like to use them in the classroom. Since then, my students and I have traveled to Athens, The Metropolitan Museum of Art, Santa Monica Pier, Eiffel Tower, Bahamas, St. Louis Arch, the Arctic, and more. We've rode a roller coaster, traveled in space, and went on safaris with elephants, lions, and giraffes. You can't experience the full wonder of a place without actually going there! How much is this?? Where can I buy one?? 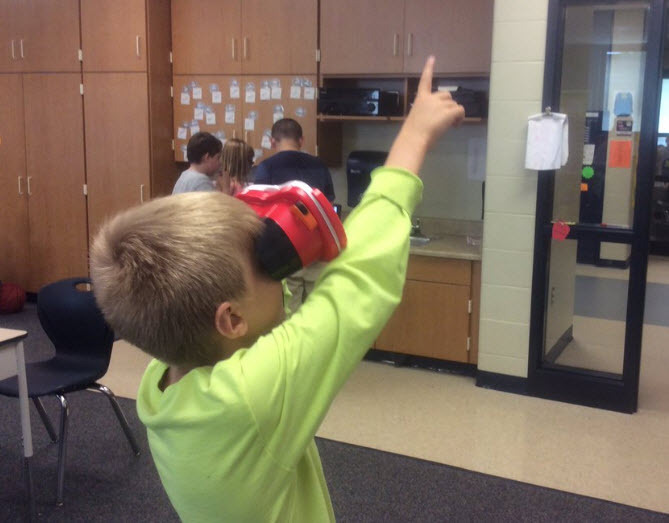 East Noble School Corporation started an #ENMakerRevolution with our first annual (hopefully!) MakerDay. District-wide, K-12 students were given a problem to solve, materials, and a set amount of time to plan, design, test, and re-design their prototypes. I have to say, these kids have been exceeding my expectations all year long. I don't know why they keep surprising me, but they do. The students were able to test their prototype, observer the shortcomings, and go back and revise it to create a more efficient design. But to watch their thought-process and see their designs develop was amazing. The hardest part, as a teacher, was taking a step back and allowing students to work though a design that I knew was not likely to be successful, but then learning from that failure to create an even better model. When we started planning for this day and coming up with the questions to present to students, we thought about the likely possible solutions. What they students ended up producing was nothing like I imagined; but it was much more creativity and complex that I had ever dreamed up. In a few days, the Class of 2016 will walk across the stage as receive their diplomas for 13 years of dedication and hard work. But 2 weeks ago they made an equally important walk. Seniors returned to their respective elementary buildings to look back at how far they've come and to show our youngest students what they are working towards. It's the start to an incredible annual tradition. This has been my first year as a Technology Integration Specialist. Throughout this year, I've felt like a first-year teacher in many ways. The toughest challenges were different than the ones I had anticipated at the beginning of the year. And the rewards came in the most surprising ways. The year is done. And I'm anxiously looking forward to growing professionally this summer with a few conferences planned (or, maybe more than a few... including my first trip to ISTE! ), some books to read, certifications to earn, and, hopefully, more blog posts! ChatterPix Kids is a free app that has many uses for elementary students. It is very easy to use, which makes it ideal for even the youngest students. To get started, students will need to take a picture of an object or use a picture from their camera roll. Students then need to draw a mouth on the picture, which will talk. The final step is for the students to record themselves telling about their picture. There is a 30 second limit for recording, which helps students stay on topic and share only the important information. There are other features, as well, depending on your project. Students are able to use filters for the photos, add stickers, and add text to their picture. The videos students create can be exported to their camera roll. From there, the videos can be emailed, added to Seesaw, or uploaded to a shared Google Drive folder. Here are some ideas for how you could use ChatterPix Kids in your classroom. It’s amazing what you can learn from your students by listening to their videos. I gain so much understanding about where my students are at and how I can better help them when I can hear their reasoning as they explain their thinking. Below are a few examples of South Side students using Chatterpix Kids. Hopefully these videos will help you think of ideas for using Chatterpix Kids with your students. Second grade students shared their understanding of moon phases. First grade students practiced reading fluency. Second grade students took a selfie and then shared Internet safety tips. Students in 2nd Grade at Rome City Elementary School were starting a unit of study on fictional writing. In the past teachers had students used the StoryKit App to make digital stories, but the teachers were not satisfied with the app and asked me for help finding a better option. 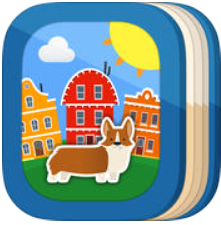 This led me to find the free version of the My Story App, My Story Book Creator for Kids App. This is by-far the easiest to use and most kid-friendly digital storytelling app I've found for grades K-4. The app gives students the ability to organize their stories page-by-page. They can type and/or hand write their sentences. Their illustrations can either be drawn right in the app or uploaded from their camera roll. And one of the best features is that students can record themselves reading their stories. The process is simplified and easy to use. Finally when students are done creating their stories, they can save the story as an MP4 file, turning it into a video to upload to the web, send in an email, or post to SeeSaw. It seems like every time I show this app to teachers, they find a way to use it. 4th Grade at Rome City Elementary School are using this app during their unit of study on energy sources. The students are using the My Story App to create informational videos showcasing what they've learned about their given energy. Then they will present their videos to the rest of the class. When I walk away from a conference, I feel energized. 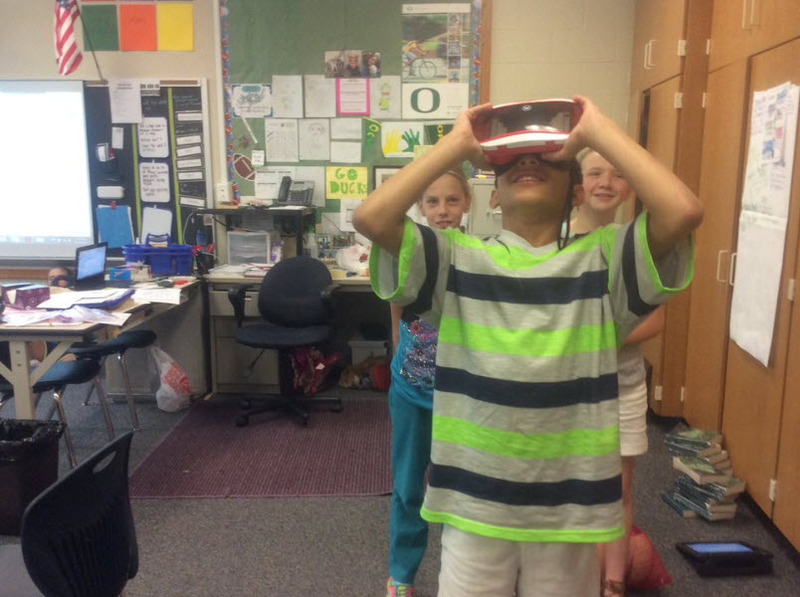 I'm excited and eager to try out a new strategy or use a new technology tool in my classroom. The problem is, of course, that feeling doesn't last. Three weeks later, my focus narrows and I lose sight of the big picture in the midst of all the ephemera. Twitter, and, in particular, Twitter Chats are great ways to experience and be part of that same kind of environment on a weekly basis. When I first heard about Twitter, I was initially very skeptical. I didn't understand how any meaningful conversations could happen in 140 characters and I've certainly never been known for my concision. I just couldn't wrap my mind around how it all was supposed to work: Tweets. Growing your PLN. Twitter Chats. Trending Hashtags. It seems chaotic enough to turn off even the most well intended teachers. But, it just may be one of the best ways to keep informed and inspired during the daily trudge. Don't take my word for it - read about it here, here, here, and even in this article from ASCD in 2010 here. I am by no means an expert in Twitter and it can still be a challenge for me, but I'm trying to take a Growth Mindset approach to using Twitter to grow my PLN and to improve my coaching and teaching. Back to Basics: What is Twitter? What is and how do I use hashtags? What's a Twitter Chat? Twitter: Originally Twitter was advertised as a micro-blogging social media platform. Essentially it is a way to share and find information on any topic you are interested. The catch: You have only 140 characters to write our your messages. This makes for quick, short bits of information that are easily digestible. Hashtags: Finding information is easily done on Twitter though the use of hashtags. A hashtag is a word or phrase following the # symbol. Searching a hashtag will consolidate all posts related to that topic. For example searching #edtech will show all posts related to Educational Technology. Want to find information and advice specific to new teachers? Search #ntchat. Reply, Re-tweet, and Favorite: If you find a tweet and want to add to the conversation with the author, you can reply to the original post. If you find a tweet that you like, you can retweet it to your follows and, if desired, add your own commentary to the tweet. You can also favorite the tweet to let the author know you liked it and so you can easily find it later. When I searched the #3Musketechs, I found this tweet from Edulastic. I re-tweeted it to Ann Ventura adding my own hashtags #INeLearn and #edtech. Now anyone who searches for #INeLearn or #edtech will be able to find the post. Twitter Chat: Participating in a Twitter chat moves you beyond a simple hashtag. 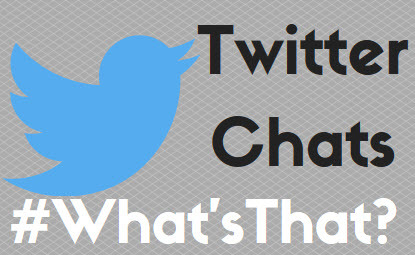 Twitter Chats are led by facilitators who organize a time to discuss a particular topic or set of questions. For example, #edtechchat discusses all things related to educational technology on Mondays at 8-9pm EST. That's well and good... But it's too chaotic for me! If you've ever followed a Twitter chat, you know that it is fast-paced environment with multiple threads of conversation happening at the same time. At first, this was a major deterrent for me. I wanted to consume everything. I felt overwhelmed trying to follow every line of conversation at the moment. And it was impossible to get anything meaningful out of the experience. The best way that I've found to engage in a Twitter chat is by starting conversations with a few people. If someone says something insightful, or that you'd like to discuss further, reply to that person's tweet. It's like being at a party - you will never know what everyone says. You can't be part of every interaction, but you can form sub-groups to connect with others. Then after the chat you can review the posts and look at the archived messages to see what you missed. But the only way that I can follow a Twitter Chat is by using a service like TweetDeck. TweetDeck organizes your Twitter feed into a manageable, easier to follow format. You can add columns to follow specific hashtags (like I did here with #etcoaches). As people post using the hashtag, the tweets will appear in the column. #edchat: General education discussion | Tuesdays at noon EST and 7pm EST. If you are overwhelmed by Twitter (and I was too when I first started), it's okay to observer (or lurk) for awhile.You may forget about it for awhile, but don't give up on it; and come back to it when you need a refresher or inspiration. Like I mentioned before, I am by no means an expert on Twitter, but I'm taking a #growthmindset approach to expanding my PLN. If you have questions, suggestions, or comments please connect with me on Twitter or email me.